Droughts are one of the most devastating natural hazards, often causing severe economic and environmental damage. Across Eastern Australia climate is highly variable and frequent floods and droughts affect large areas over prolonged periods of time. Understanding the variations and trends in these weather extremes is critical for ecologists to assess the adequacy of management plans for anthropogenically affected landscapes such as agricultural or post-mining land, where water often plays a critical role for ecosystem persistence. In this study we use a new approach developed as a management and/or risk assessment tool for degraded land rehabilitation to quantify periods of water deficit using the severity-duration-frequency (SDF) of rainfall, known as design droughts. This approach is based on the intensity-duration-frequency (IDF) design rainfall concept used by engineers for designing hydrological infrastructure. This study focuses on analysing drought events of four selected locations (Cairns, Melbourne, Wagga Wagga, Quilpie) across Eastern Australia using the Reconnaissance Drought Index (RDI). We used monthly total rainfall and evaporation data of the past 40 years (1972-2013) to identify drought events. We categorised the drought events according to their severity and duration and analysed separately the historic time series as two parts of 20 years (1972-1992 and 1993-2013). We calculated the recurrence intervals of droughts to assess trends in the occurrence of drought events. 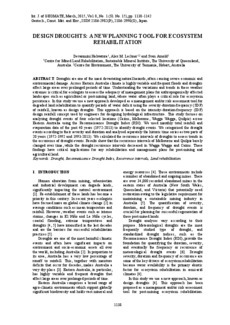 Results show that the recurrence intervals of Melbourne and Quilpie barely changed over time, while the drought recurrence intervals decreased in Wagga Wagga and Cairns. These findings have critical implications for any rehabilitation and management plans for post-mining and agricultural land.